Stalley said a number of conditions factor into the declaration of extreme drought, including the health of local vegetation and lake and reservoir levels. But the biggest factor is rainfall amounts compared to normal. He said North Texas is 4.17 inches short of normal rainfall for June and July, and that comes after a drier-than-normal spring, making matters worse. But a weather system entering the region over the weekend could help, he said. A cold front could bring rain beginning late Sunday and lasting into Tuesday, Stalley said. “It will lower temperatures to normal or even below normal, and we’ll have some showers and thunderstorms,” he said. Current drought conditions for Tarrant County and surrounding counties provided by the National Weather Service and U.S. Drought Monitor. High atmospheric pressure has been keeping rain at bay and is related to the extreme heat North Texas has experienced recently, Stalley said. But don’t expect the rain to lift the area out of drought conditions, said Jason Godwin, also a National Weather Service meteorologist. Forecasters are expecting about a half-inch of rain over the next week and less than two inches of rain in August, Godwin said. 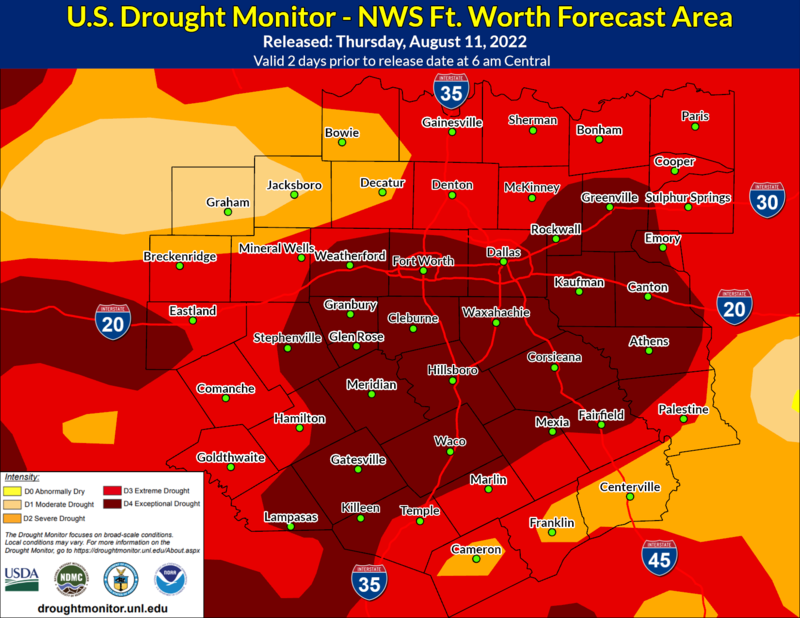 Typically, August is the driest month of the year in North Texas, Godwin said. After the below normal temperatures and the rain, expect more normal August temperatures in the mid-90s, Godwin said. Godwin said he is hopeful that the approaching rains will dial back the elevated wildfire situation in North Texas, where a number of counties have already issued burn bans. However, the drought conditions may persist into next year, he added. • If your St. Augustine lawn looks dry, but doesn’t respond to irrigation, check closely (hands and knees) for BB-sized chinch bugs. They can quickly kill large areas if left untreated and they are running rampant. • New tree and shrub plantings must be watered by hand with a hose and a water breaker or bubbler. Sprinkler irrigation won’t be nearly enough. Soak deeply every other day for their first two summers – especially this year! • It’s normal for older tree leaves to be turn yellow and fall. It happens every summer as they shed leaves born in the spring when conditions were better. It’s more dramatic this year. Put a soaker hose around the drip line of the tree and let it run slowly for 12-18 hours. Repeat a week or two later, but use a different hose configuration. • It’s much better to soak the soil deeply and water less frequently than it is to sprinkle the ground lightly daily. Deep watering encourages deeper root growth which is much better for plants. • If you have a sprinkler system that allows you to water an area for several short intervals 30 minutes apart in sequence, that will greatly lessen the chance of runoff and waste. Christine Ramsey records her son explaining to her why he doesn't want to go outside and warning their dog about the Texas heat. Mary Perez of Enchiladas Ole, a small neighborhood restaurant, invited anyone with no home or A/C to sit inside for water and chips as temperatures climbed toward 110. Enchiladas Ole was recently ranked by USA Today readers as one of Texas’ 10 best. This is one of the many little storms that "popped up" over north Texas Tuesday afternoon. Many produced brief heavy rains and lightning, and a few even dropped some small hail.